I know guns are a hot topic of discussion but I will tell you upfront, I am very pro gun. However, I am also very much of the opinion that being a gun owner carries a big responsibility and it should never be taken lightly. My Dad taught me from a young age about guns, in high school and even now, he has taken me to the range to practice and has taught me basic gun safety, which I'm so thankful for. So, thanks Dad! I know you are reading this. I always felt safe at home because my Dad had a way to defend our family should the worst ever happen. But you know what? I don't live under my Dad's roof anymore. Dave and I have a home of our own. Dave and I moved into our home in Spring of 2016. A few weeks after we moved in Dave went out of town and guess what happened the first night he was gone? I heard gunfire. I tried to tell myself I was overthinking the noises I heard, but I knew. Then I heard them again. And it terrified me. I called 911 but I couldn't even move in my bed that's how scared I was. We now have an alarm system and a weapon to defend ourself should the worst ever happen. However, I had yet to take training to better educate myself on this topic. Recently there have been robberies in our neighborhood. The same criminals, came to the same house, twice. The District Attorney (who should be fired and I won't vote for him ever again) didn't prosecute them even though they were caught with a car full of stolen goods and weapons. And guess who shot at the police a few weeks later? That same criminal. Lastly, the bakery I go to with my friends and their kids, was robbed at gunpoint. And it's in a fancy 'safe' neighborhood. That was the tipping factor for me. I knew I had to get training and I wanted good, quality training. I told my Dad this and for Christmas he bought me a gift card to Range 54 to go to a class. And I'm so thankful he did! 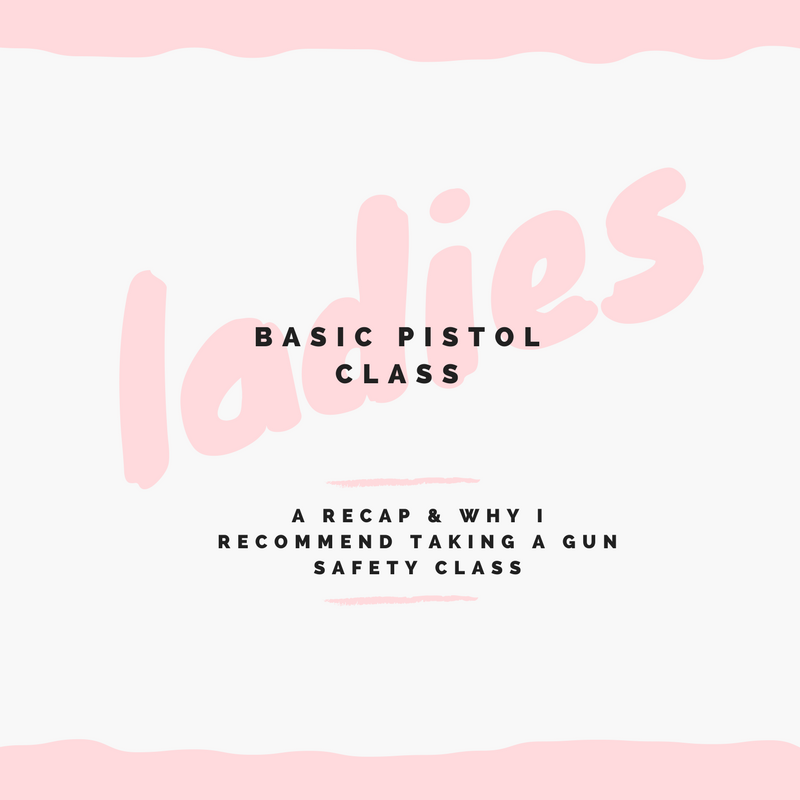 He recommended the women's basic pistol class as it is pretty much a gun 101 class. They have many classes and you can see the entire list of classes offered here. They even have an unarmed defense class for women if you don't want to carry a gun. The basic pistol class was eight hours long. It was four hours on a Friday night where you are in a classroom and then four hours on Saturday morning in the range shooting. We had a woman instructor, Brooke, and she was incredibly kind and knowledgeable. Saturday morning we had an additional instructor, Tom, who had a lot of knowledge and was able to offer lots of helpful suggestions to improve our fundamentals. 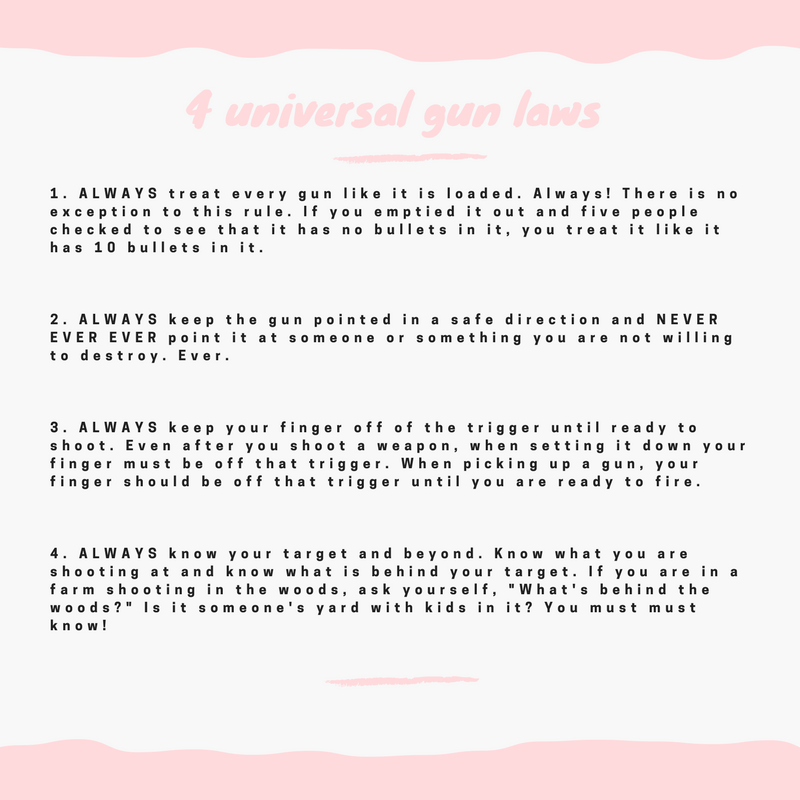 Before I go into the class and what I thought of it I want to touch on four simple but universal gun safety laws. My Dad taught me these growing up but it was nice to have them reinforced in the class. -Components of a gun - I didn't know about 90% of this. It's basically like anatomy 101 for your gun. -Ammunition - Again, I had no idea about ammunition. I didn't know the difference between a bullet, the case and that a cartridge holds all those components together. -Cleaning - How to clean your gun. We didn't have to go into details on this but the instructor said anytime we want our gun cleaned to go in and he will teach us how to do so. That infomration took about 3 1/2 hours to go over. Then the next morning we went to the range and practiced. If the idea of shooting a gun sounds scary, that's okay. I told you I've been shooting since highschool and my heart still beats really fast every single time. But practice makes it better and they don't just put you in the range and tell you to aim and fire. They walk you in the range and tell you take 5 bullets put them in your magazine and set it down. Then after everyone does that they tell you to put the magazing in your gun and to chamber it (aka, get the bullet ready to fire) and set it back down. Then they tell you to pick up the gun, then they tell you to aim, then they say when you are ready fire one time at target one, take your finger off the trigger, set the gun down and step back. It sounds very slow, and it is, but it makes you work on technique, form and it isn't as scary this way. They had different drills for us to do as well. One was where we would aim and the instructor would pull the trigger. That would allow you to see if you are flinching when firing which causes you to aim downward. Another drill was that they would put their finger over your finger on the trigger. You didn't pull the trigger but your instructor did. This gave you the correct feel for a slow, steady squeeze. It was all really interesting. We shot at two targets and I can definitely see an improvement in the second target round because I was hitting a lot more in the orange that time. I highly recommend taking this class, especially if you are in the Wichita area. It was very informative and I feel much more educated from those eight hours. The instructors are knowledgeable, patient and answered our many questions. I plan to continue taking classes there as well as shooting more often in the range. I think the more you know and the more you practice the better. If you aren't in the Wichita area I highly recommend finding a school in your local area. Lastly, know the laws for where you live. If you own a gun you you are liable so be informed and educated. Do you have any questions for me? Would you ever consider taking this class? Have you ever taken a class like this? I've never shot a gun or taken a class, but I do think it is something that women should learn. I wouldn't know what to do if I was in a situation and a gun was around that I would need to use to protect myself. Very important topic and thing to know- great post! I've never taken a course before but my sister has and loved at least learning the basics of how it all works just in case! I'm right there with you though, because our area (Little Rock, Arkansas) has quite the bad name in some areas for crime and you just honestly can't ever be too safe or cautious! I'm also a real estate agent and it's a constant on my mind as safety is EVERYTHING to my job! Thank you so much for sharing your tips on this!! So very helpful! !